The British Society of Baking (BSB) was founded in 1955 by a group of leading UK bakers who had attended the American Society of Bakery Engineers (ASBE) conferences. Impressed with the content and organisation of the American Society’s conferences, they felt that a similar organisation in the UK would be helpful for people involved in all aspects of the UK baking industry. A typical British Society of Baking Conference presentation. The BSB initially had the rather grand title of ‘British Chapter, affiliated to the American Society of Bakery Engineers’, before simplifying our name in 1978 to the British Society of Baking. We informally retain our links with ASBE, now called the American Society of Baking, exchanging publications and information, although we operate as a completely autonomous body. The British Society of Baking conferences are the cornerstone of our activities. We normally hold two conferences per year but for 2015 we are planning one major conference to celebrate our 60th Anniversary, which is being held on the 13th and 14th of October. 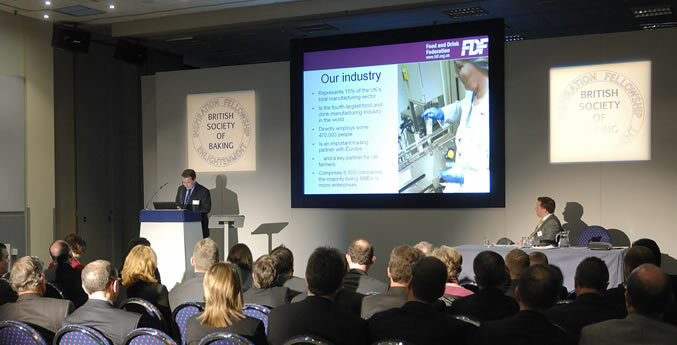 There have been over 550 conference presentations by industry experts on a wide ranged of subjects since the founding of the BSB. Transcripts of the presentations at each conference are edited and together with illustrations and photographs, are published for our members in a high-quality full colour booklet called the BSB Conference Proceedings. As a leading institution in the bakery sector of the food industry, presentations to the BSB have a tradition of influence within the industry. The importance of fibre in the diet was highlighted by one of our conference presentations in the 1970s, for example, and, in more recent years, the health concerns of using of hydrogenated fats in bakery products was covered in a conference presentation, including their replacement with non-hydrogenated fats. You can see a timeline of our activities in the bakery industry below. We also take part in major exhibitions in the UK, such as Foodex. Why not join us today? British Society of Baking members include retail, plant, wholesale and craft bakers as well as suppliers like millers, ingredients sellers and equipment makers. Many of the UK’s food research bodies and bakery schools and colleges are members. With our emphasis on learning and technical expertise, we have made cash grants to colleges and universities that teach bakery in Britain and Ireland for specific projects. Bakery students and trainees are very welcome as BSB members for a discounted fee of £30 (this also applies to recently qualified students up to 25 years of age). For more information, see our membership section.